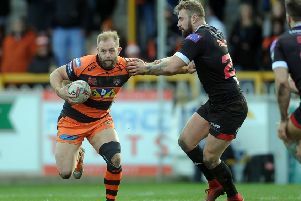 Luke Gale, expected to play for Castleford Tigers against Wakefield Trinity. Castleford Tigers head coach Daryl Powell has named his 19-man squad to take on Wakefield Trinity at the Mend-A-Hose Jungle on Friday night. It could be the last home game of the season for the Tigers, who are hoping for a big crowd to send them on the way to the play-offs. The squad shows just one change to the 19-man squad who claimed victory over Huddersfield Giants last week with Will Maher replacing the injured Joe Wardle. Powell loves a local derby and knows how much the fans enjoy it. He said: “Castleford and Wakefield fans don’t always like each other and it’s all about who can win the banter battle when they go into the work the morning after the match. It should be a great game for the fans. Tickets are available from the Tigers Den club shop in Carlton Lanes, from the Castleford Tigers Sports Superstore in Xscape and via the Tigers online box office. Fans can save £2 per ticket by pre-purchasing tickets instore prior to game day. 15. Jesse Sene-Lefao, 4. Michael Shenton, 21. Jake Trueman, 32. Liam Watts, 3. Jake Webster.